It is now one year since ClimateGate took over. 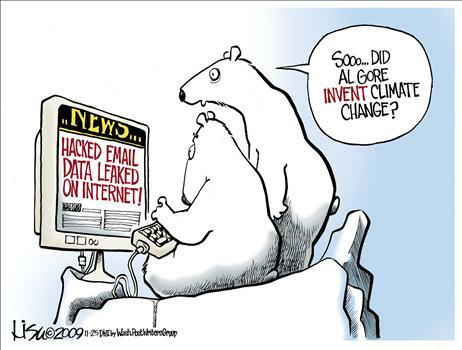 The result ClimateGate had was a chilling effect on the media and warming effect on international developments. Bringing more sceptics in the order of science and environmental science, ClimateGate still proves to be scandalous. In the same article James said that in December of that year, the UN�s Copenhagen climate talks broke down when a negotiating document was leaked. While we may agree or not with James Corbett opinion, or whether we can make sense of this gated confusion or not, these are the alleged emails that changed the course of international policy on Climate Change. From the �Harry Read Me� file to an alleged email that states, "If they ever hear there is a Freedom of Information Act now in the UK I think I'll delete the file rather than send to anyone". Another alleged email starts out by saying, �laughable that CA would claim to have discovered the problem. They would have run off to the Wall Street Journal for an exclusive were that to have been true. But the series does not end there another of these alleged emails says, "The main part has been one of your House subcommittees wanting Mike Mann and others and IPCC to respond on how they produced their reconstructions and how IPCC produced their report. In case you want to look at this see later in the email! Also this load of rubbish!" Climate-Gate trashed the reputation of several scientists and of the scientific community and spreads like a virus through the reports. From the Climatic Research Unit at the University of East Anglia to the IPCC report. And yes, few people actually did read the IPCC report. As scientists are questioned for altering reports, as the IPCC admits there estimations to 2050 where slightly off, and even more controversial statements find their way into the light, gas and oil developments project themselves to the Artic because the ice is melting. Few alleged emails have the power to change the world. This Climategate ads confusion to more confusion. A tainted reputation that still to the date is costing international development policy and carbon emissions policy too much.